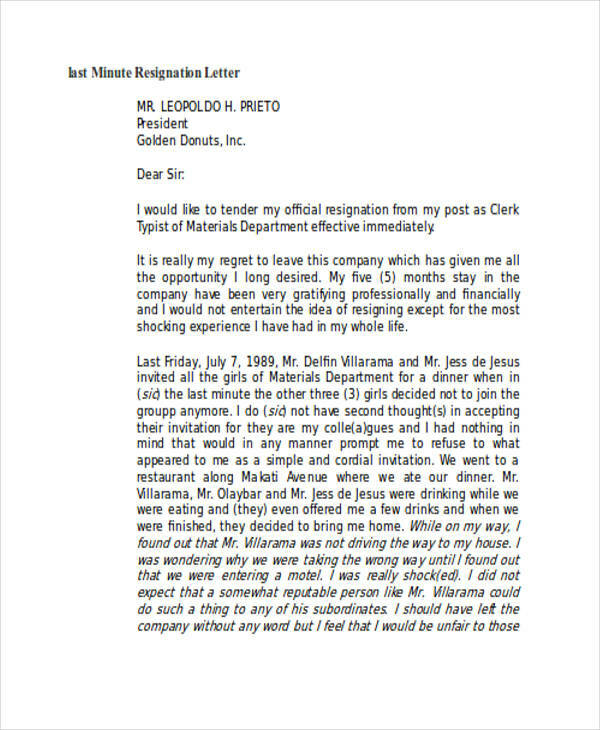 Sometimes, no matter how much we want to stay in a company there are just unavoidable reasons for us to finally say goodbye. 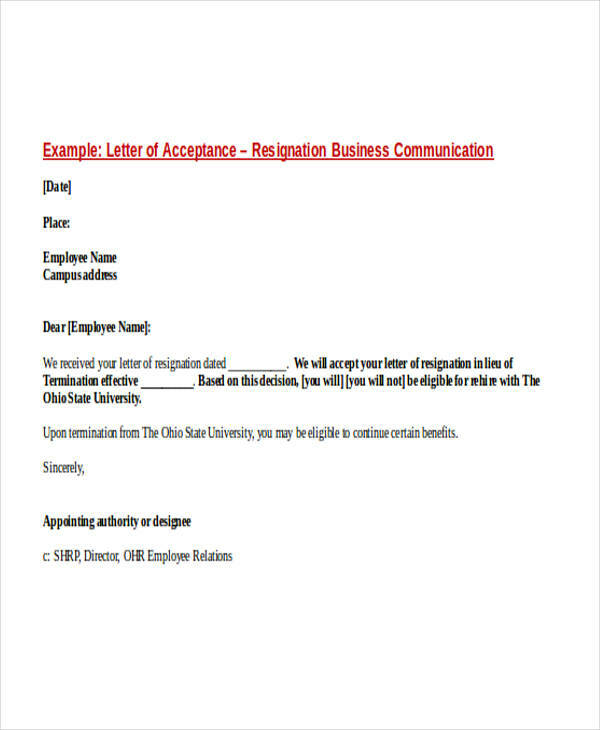 In the business world, when an employee or someone working for a corporation has to leave, a resignation letter has to be drafted. 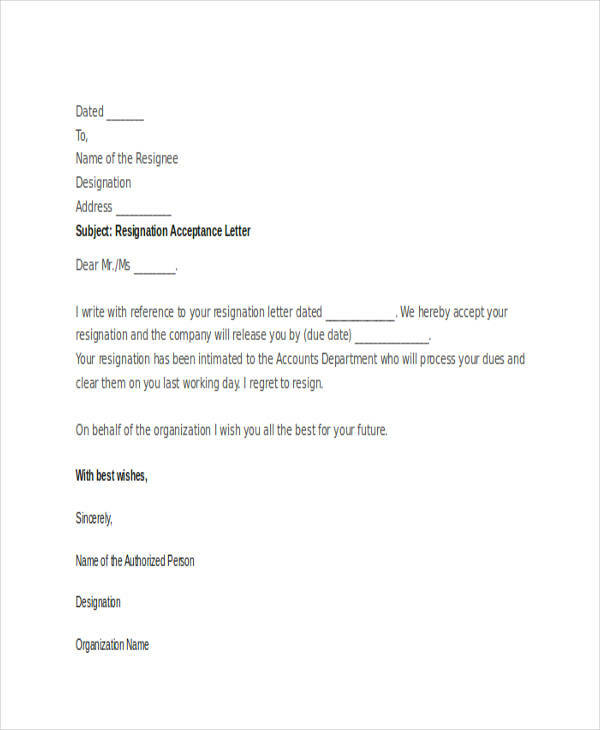 Some business agreements would often indicate that upon an employee’s decision of separation from the company, a resignation letter has to be furnished. This is simple business etiquette. 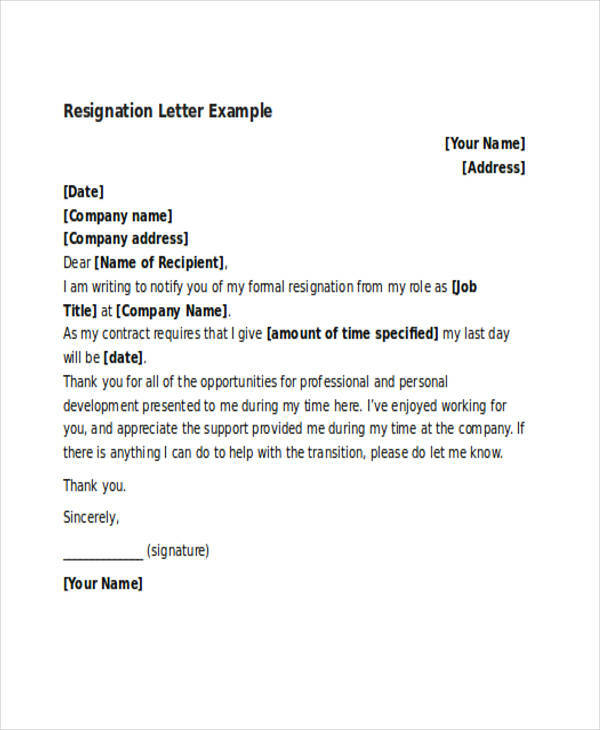 However, writing a resignation letter is hard especially if you are afraid of expressing yourself or you have never simply tried writing one. 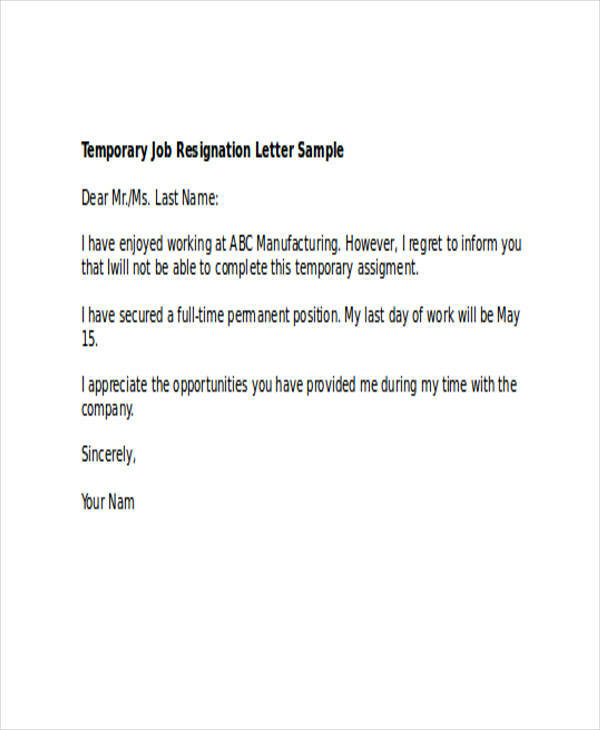 Don’t drain yourself too much because we have a couple of samples for you which you can use to write your own resignation letter. 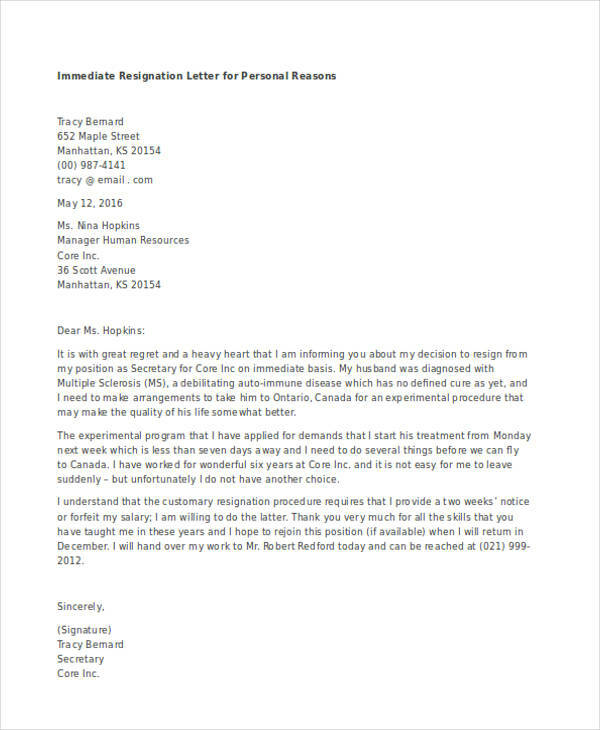 A resignation letter is commonly addressed to the head of the institution, the human resources manager, or the immediate supervisor—whichever is higher or tasked to address cases of employee separations. 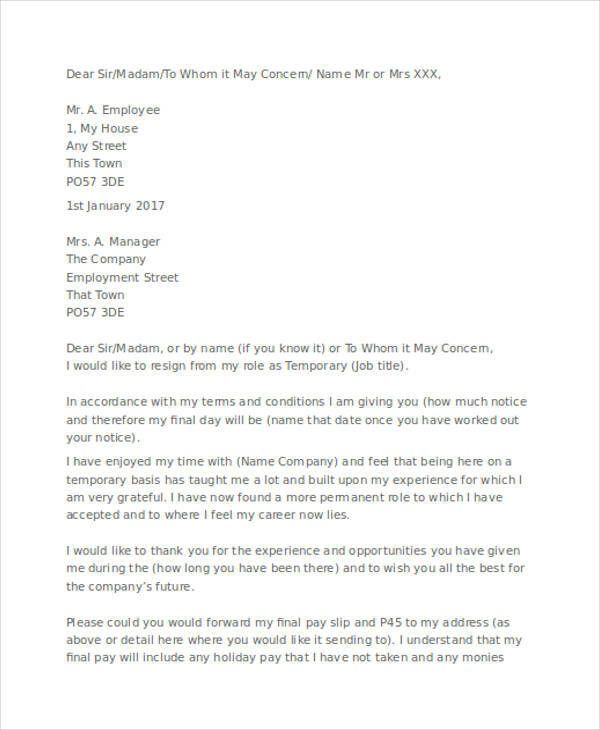 In some countries, the handing out of this letter to whoever is in charge is the commencement of a grace period an employee needs to render to the company. 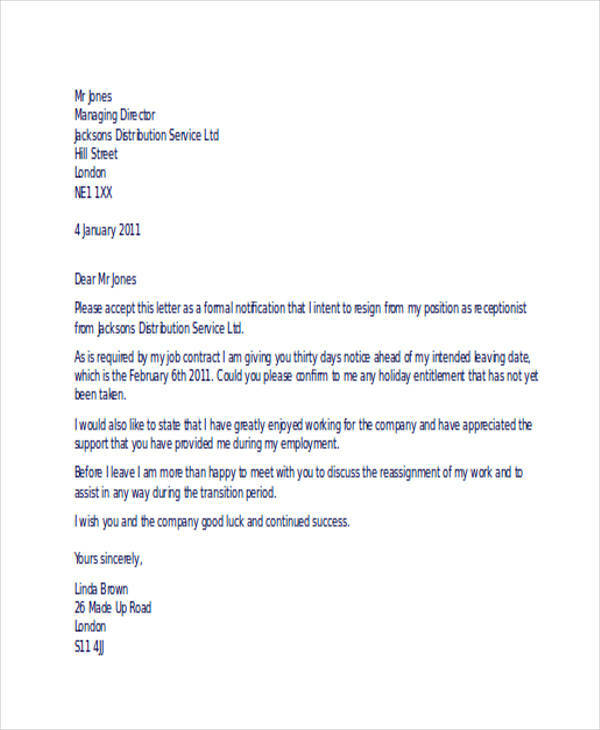 It usually is around 30 days, depending on the agreement by which the employee has signed on his/her contract. 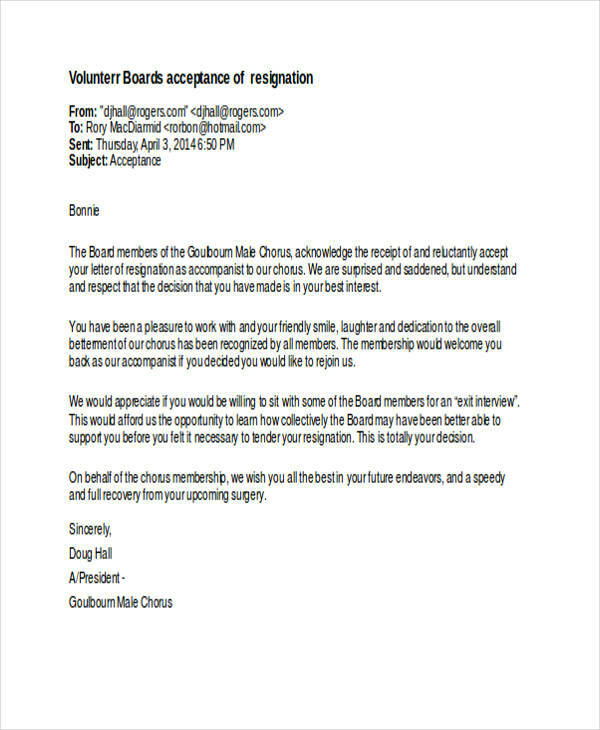 This gives the company an ample time to find a recruit to replace the position to be vacated. 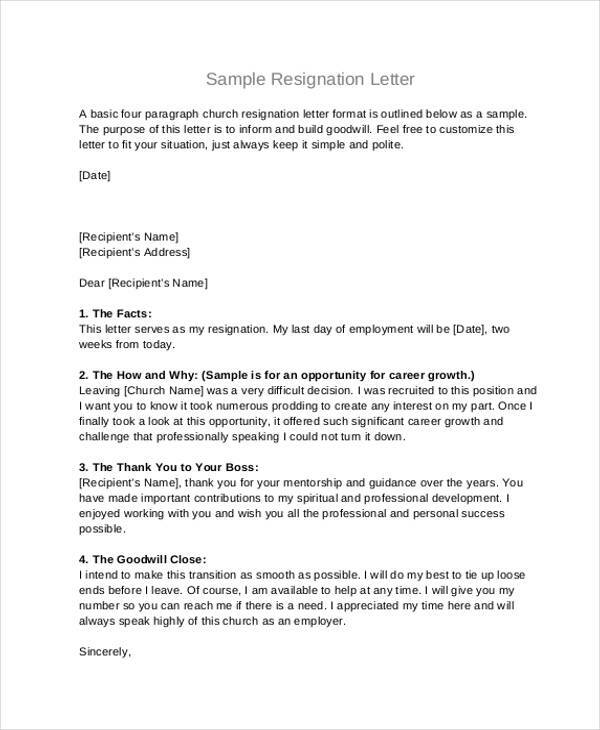 Why Do You Need to Write a Resignation Letter? 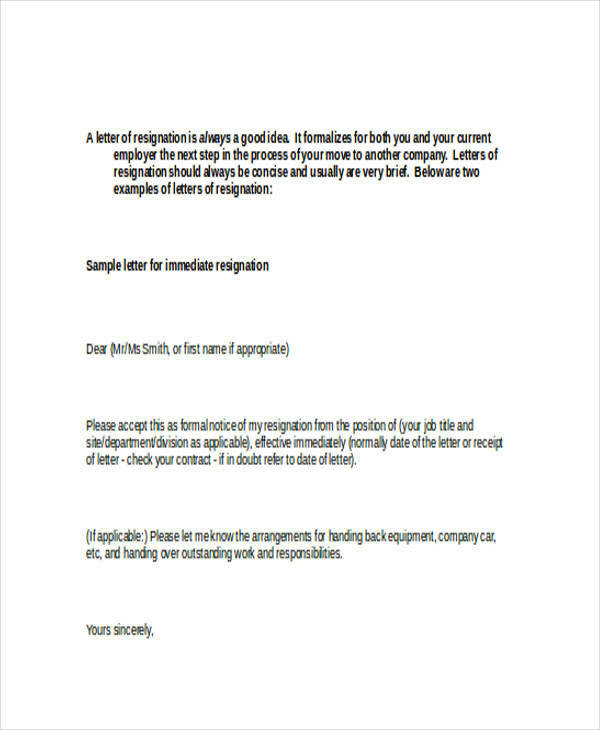 You need to write a resignation letter to maintain a positive relation with the company you are leaving. 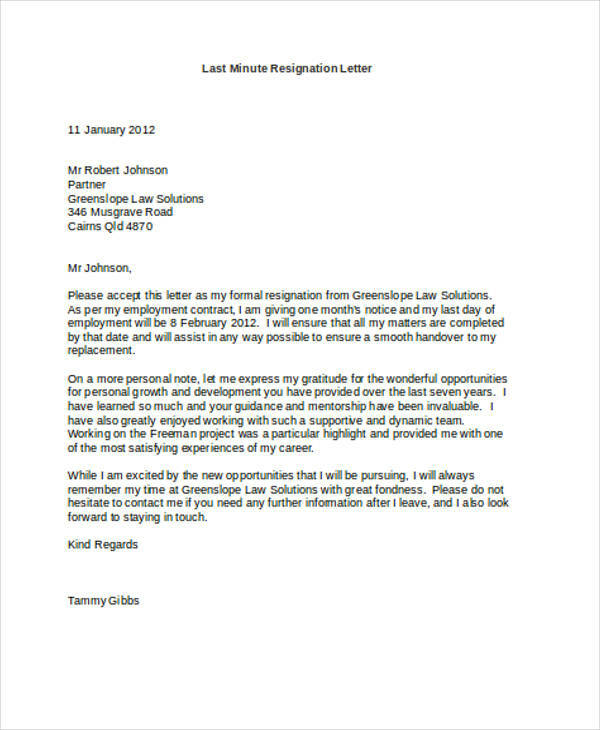 You will get the chance to leave a final good impression and that your stay with the company has been the best experience you had. 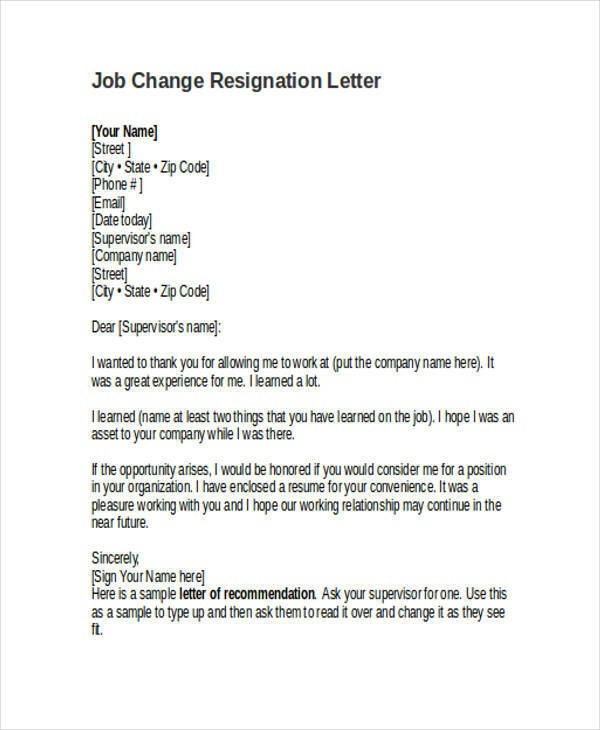 In some cases when the reasons for leaving are negative, this gives a chance for the company to make it up or at least do something about your complaint. 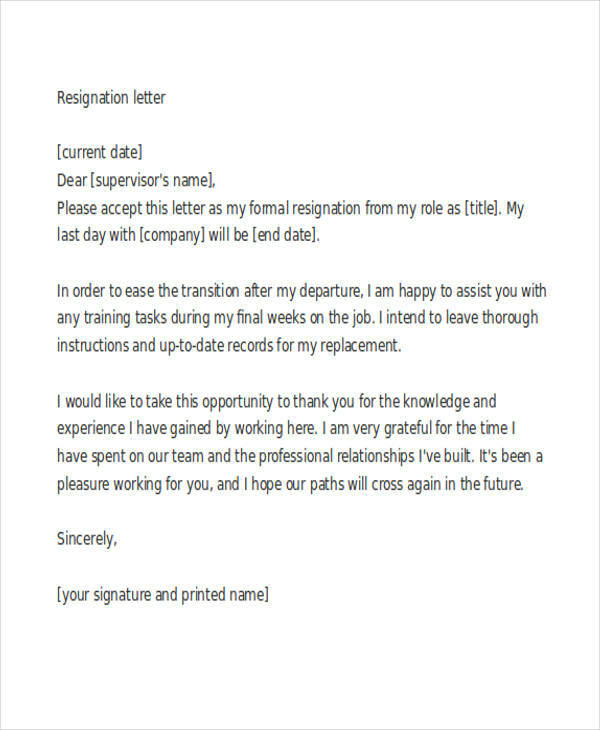 There are also other cases when the handing out of the resignation letter by the employee paves a way for a better offer in the company, specially if he/she has contributed much and losing him/her is a great loss to the company.It allows them to grow. Your comment might be perceived as a constructive criticism so they could do better. 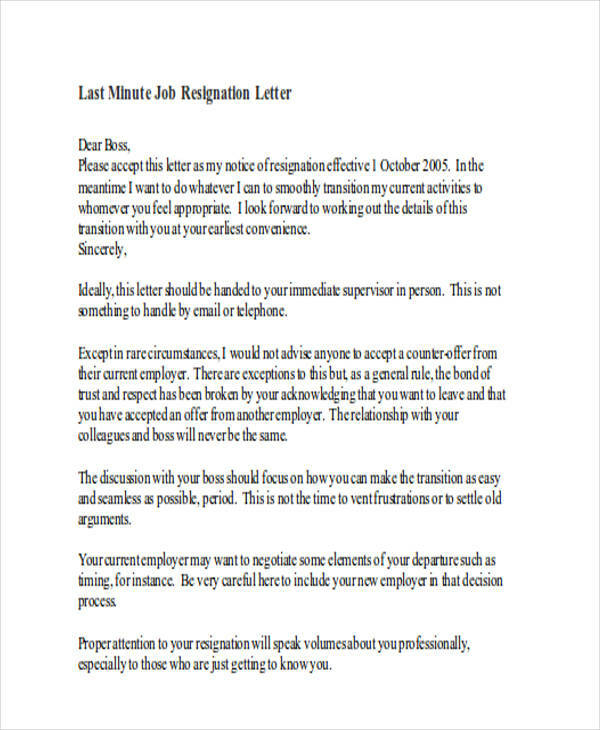 The content of your resignation letter will reflect how much the company means to you even if you are leaving. Make sure to write it with a positive vibe. 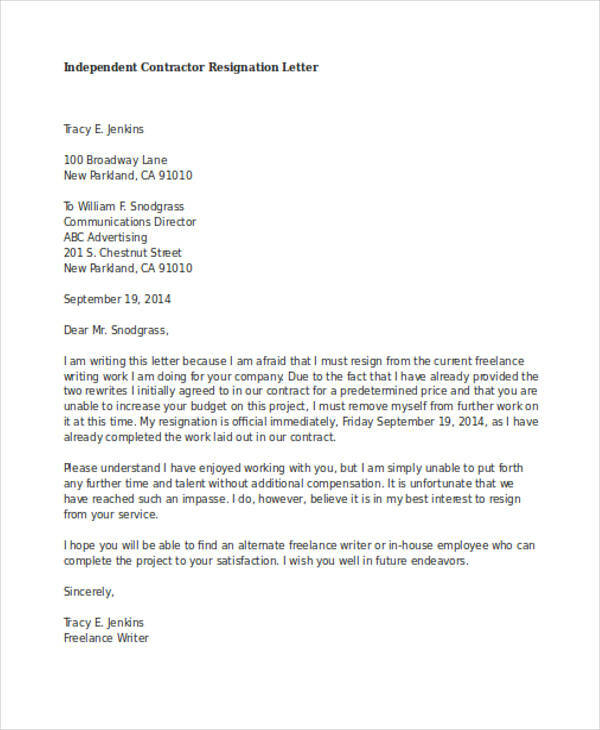 You may read some sample resignation letters, but never copy the content. Make it personal. You may follow their structure of writing but make sure to write with your own words and it should come from within your conscience. 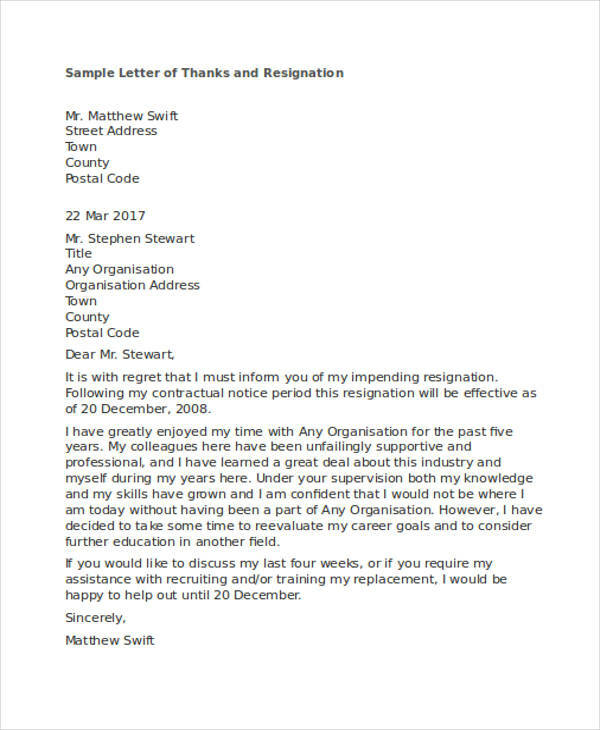 If writing a resignation letter is your final and absolute decision to leave the company for good and not expecting an offer for a higher position or salary, then be clear with your intention. 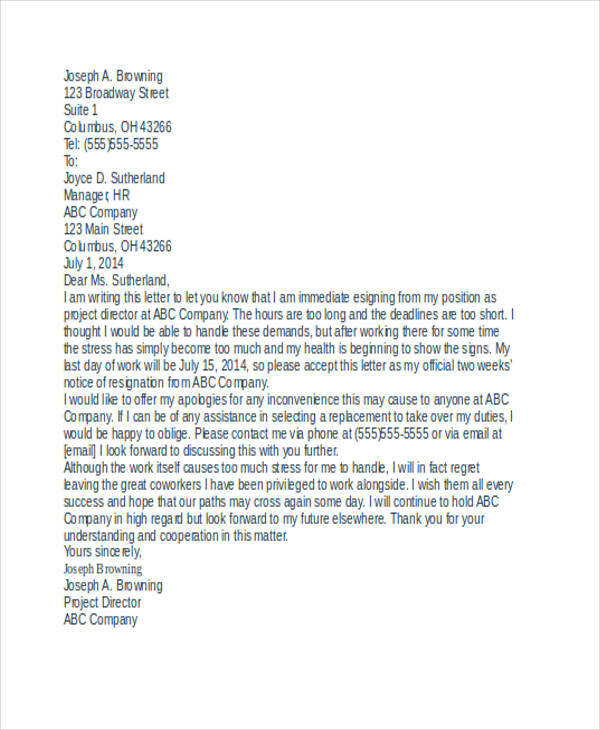 Your letter should sound confident so your boss would not have to guess what you want. 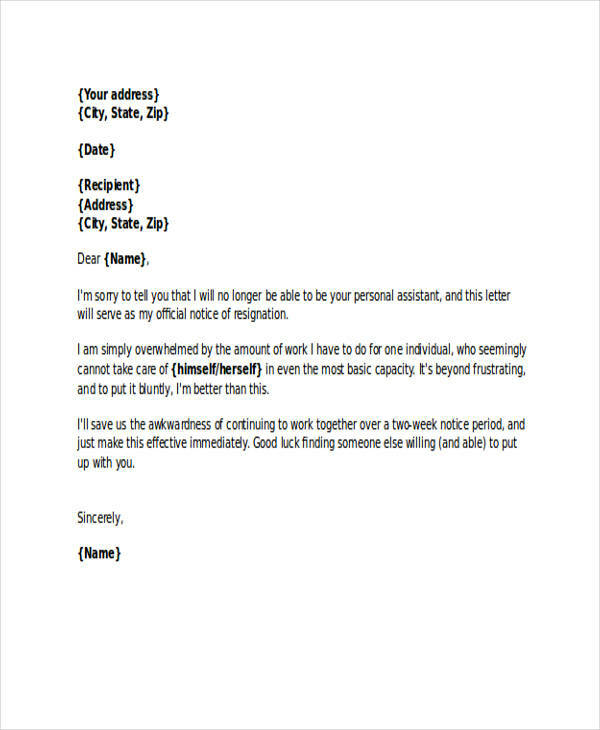 Be courteous in providing your letter specially when giving the notice. 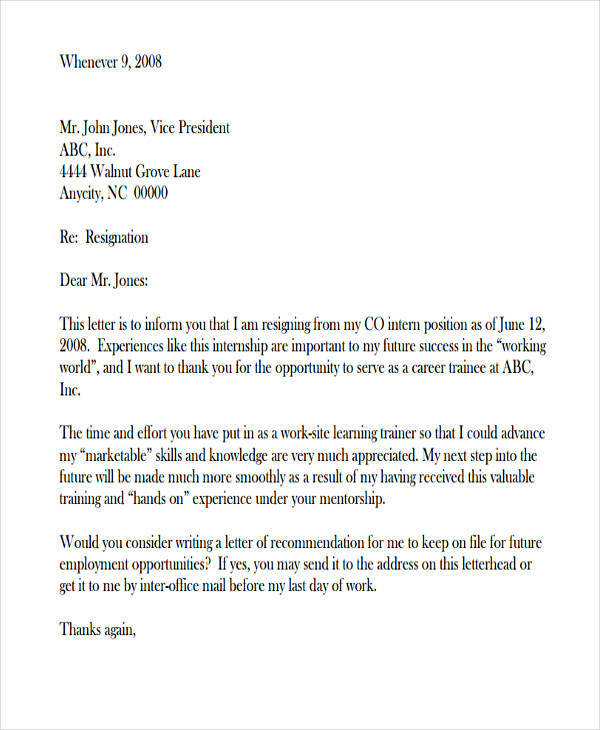 Some companies would require you to provide the letter at least two to four weeks before, depending on the complexity of your job. 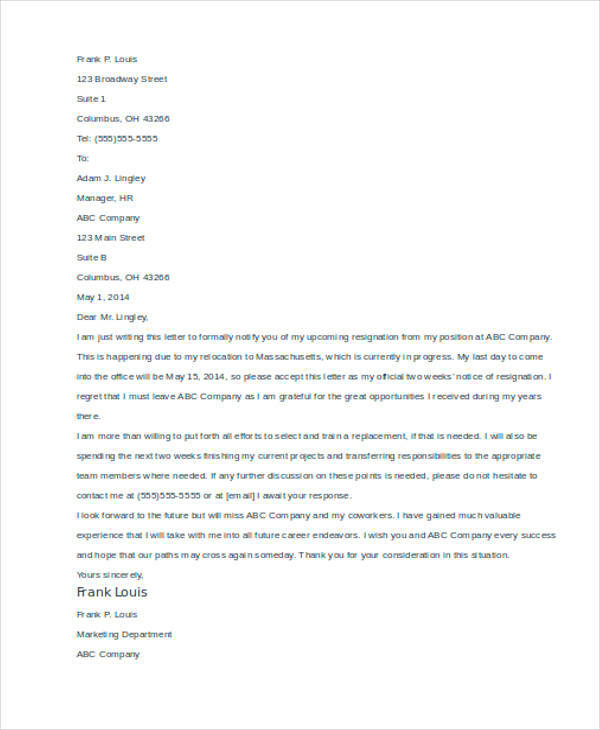 This will be beneficial for the company to find a replacement. 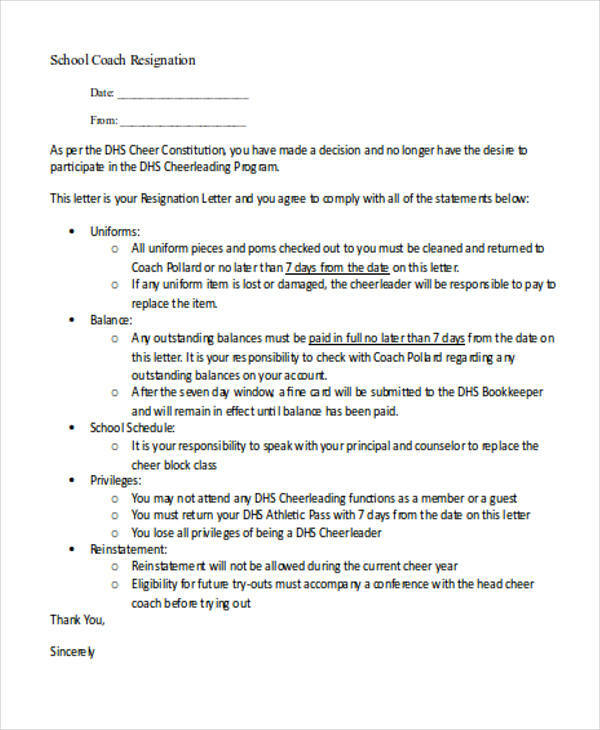 Example: Please accept this letter as a formal notice of my resignation. 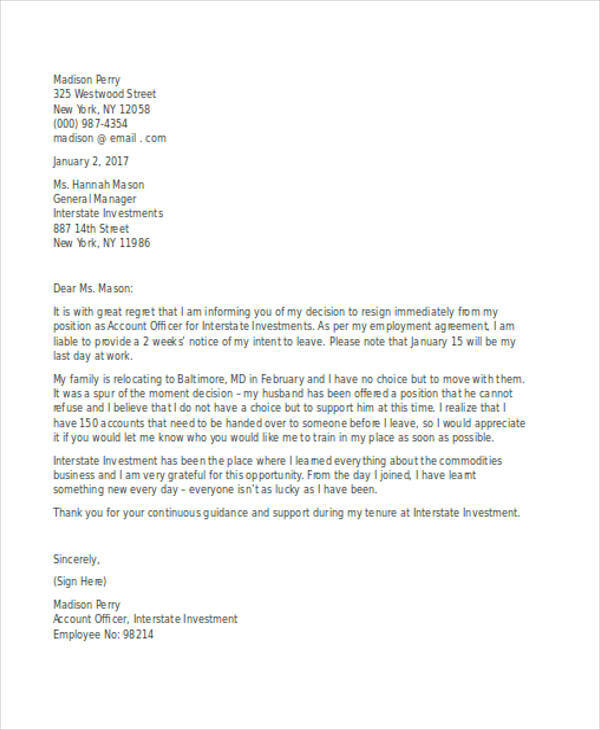 My last day of work is on February 29, 2017. 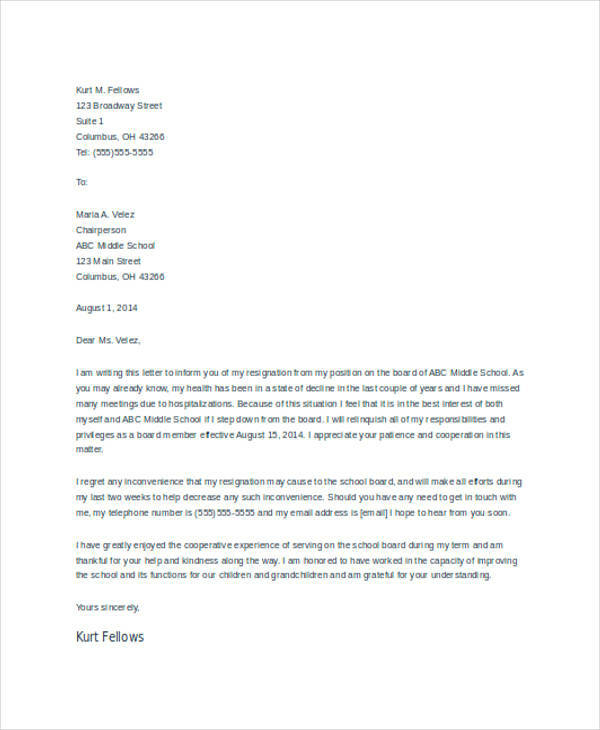 Being appreciative of what your company has done for you isn’t too much to ask. Be thankful that you were given a job and that it helped you, even if it’s just with your bills. 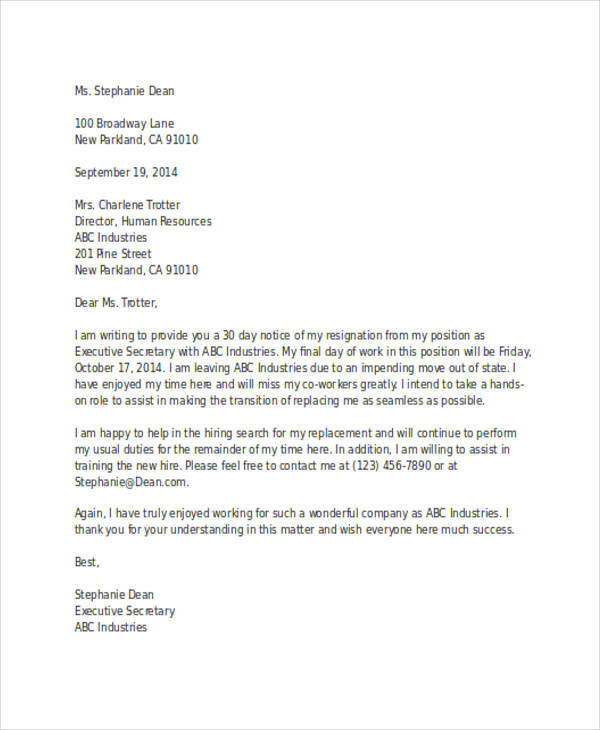 You can say thanks by offering assistance to train your replacement. 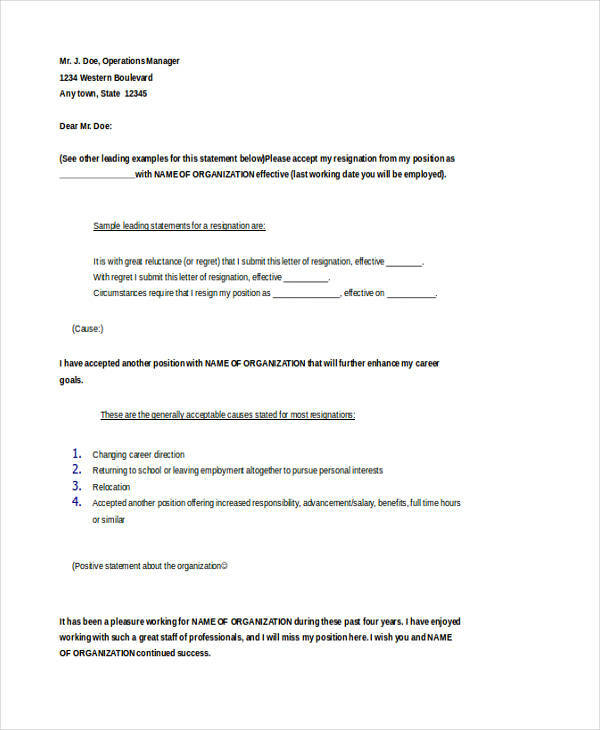 By doing this, you are showing that you have an excellent work ethic. 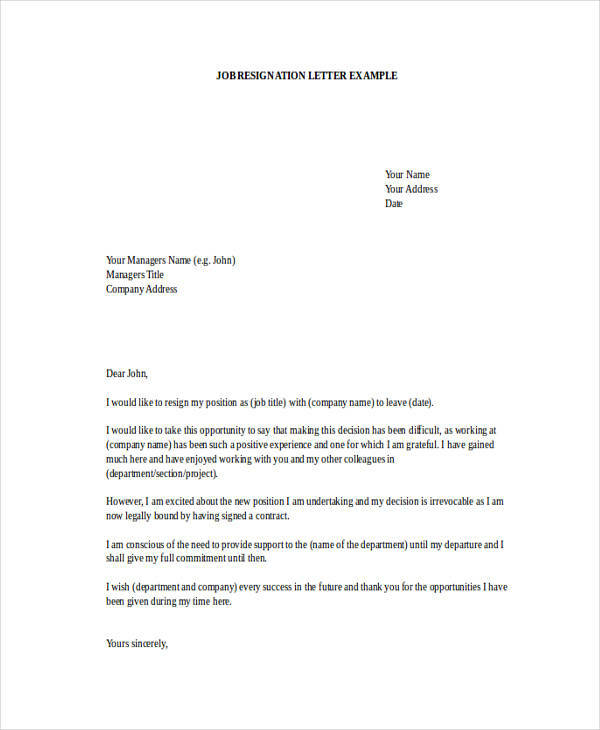 You want to end up with a positive tone so make sure to be thoughtful even in the last part of your letter. Remember that acknowledgement is still better that arrogance. 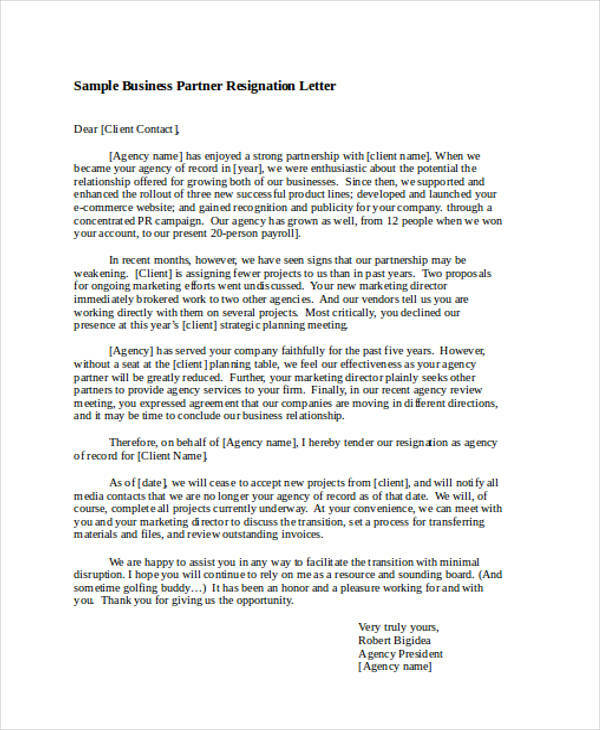 Express that you still wish the success of the company even if you will no longer be part of it. 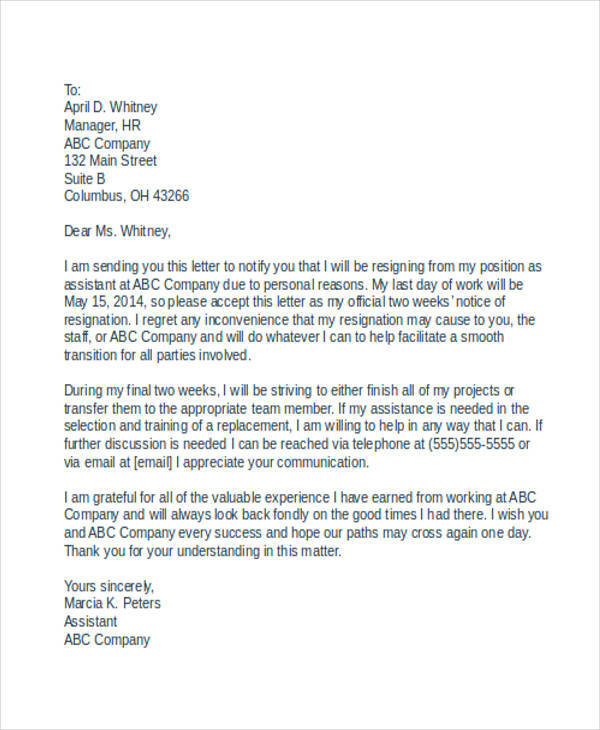 There are multiple ways a resignation letter can be used, not just on the realm of business. 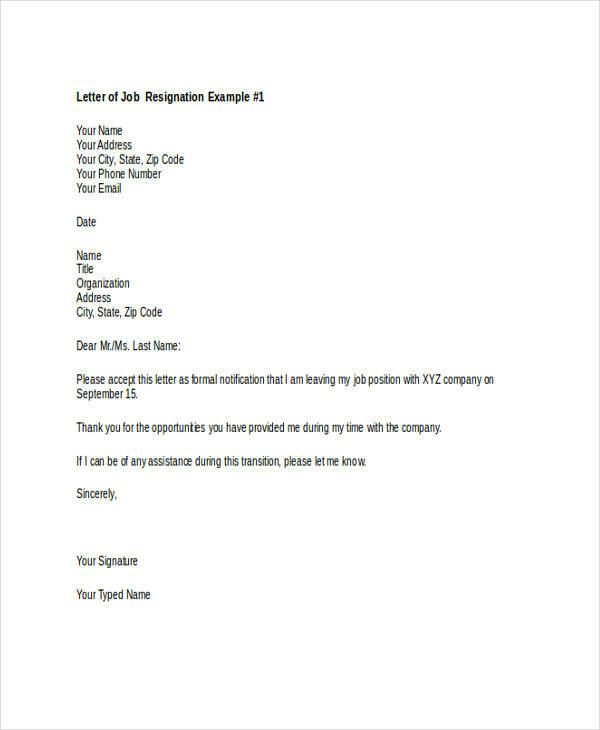 These are all different from a termination letter where it is the employer who makes the decision of the separation of the employee. 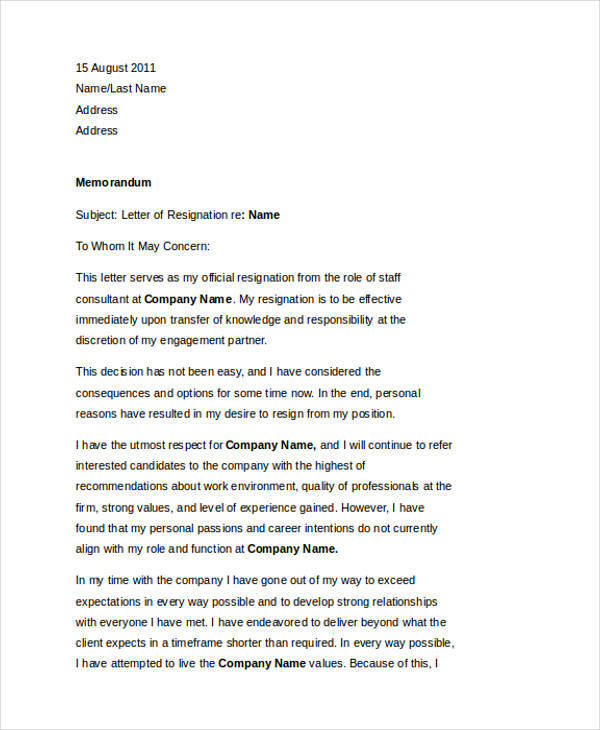 Business Resignation Letter. 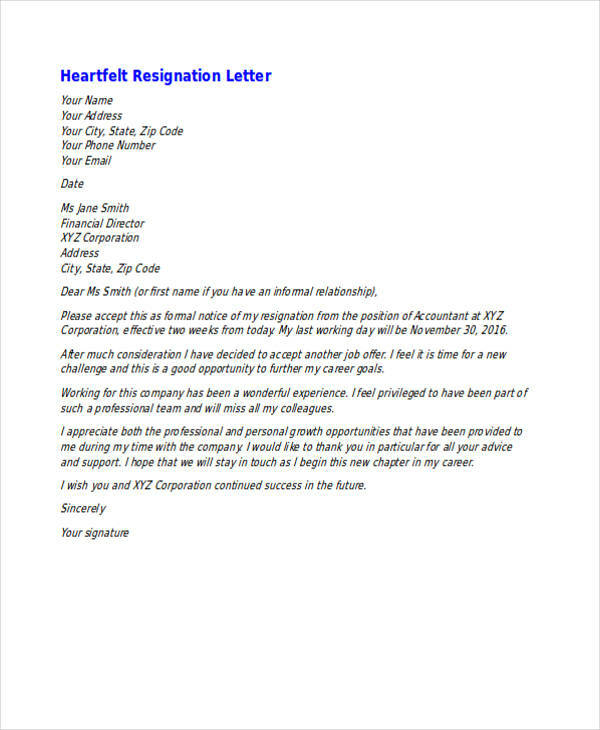 This is a common type of a resignation letter as it is used by employees who are either unhappy with their employment, who have smart goals with other companies, or found a greener pasture somewhere else. 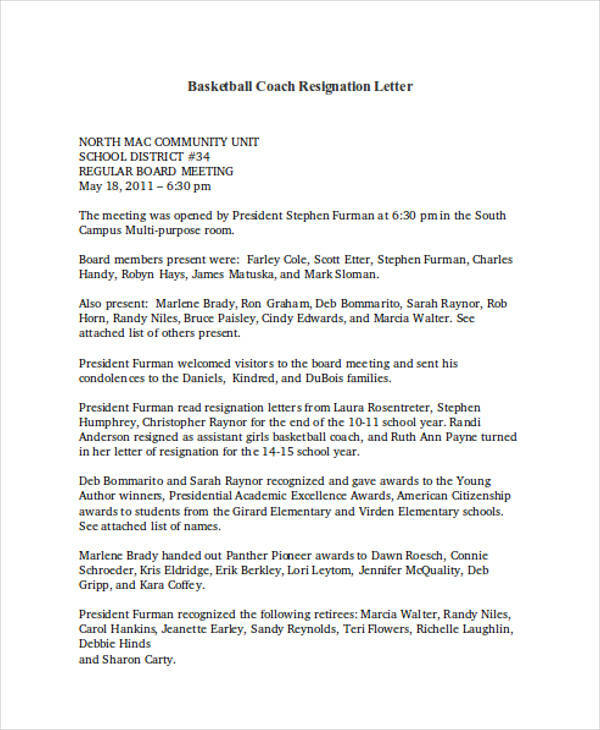 Coach Resignation Letter. 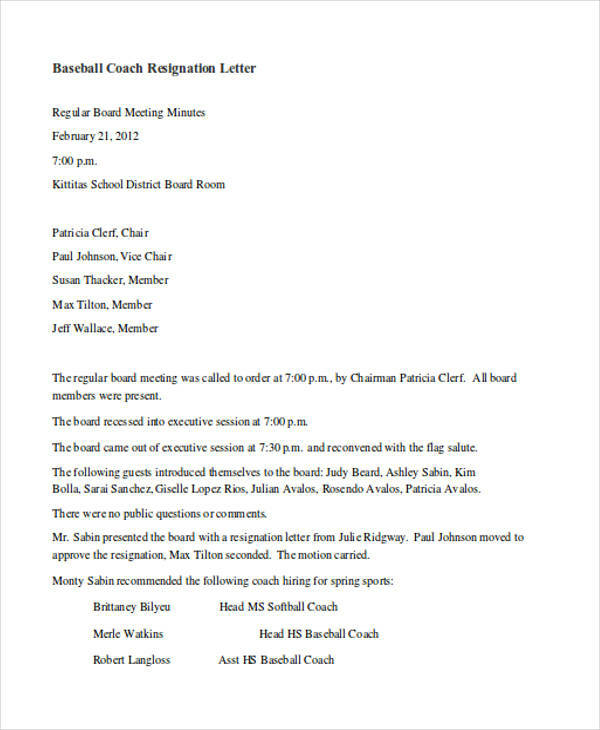 This type of a resignation letter is used by coaches or those who handle teams usually in the sporting career. These are the people who are either unhappy with their teams or fed up with the management. Either which, it’s none of our business. 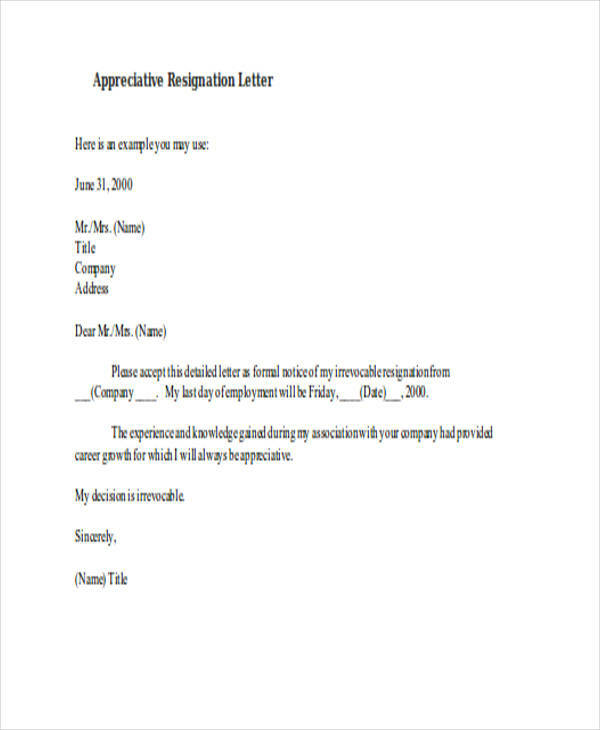 Last-Minute Resignation Letter. 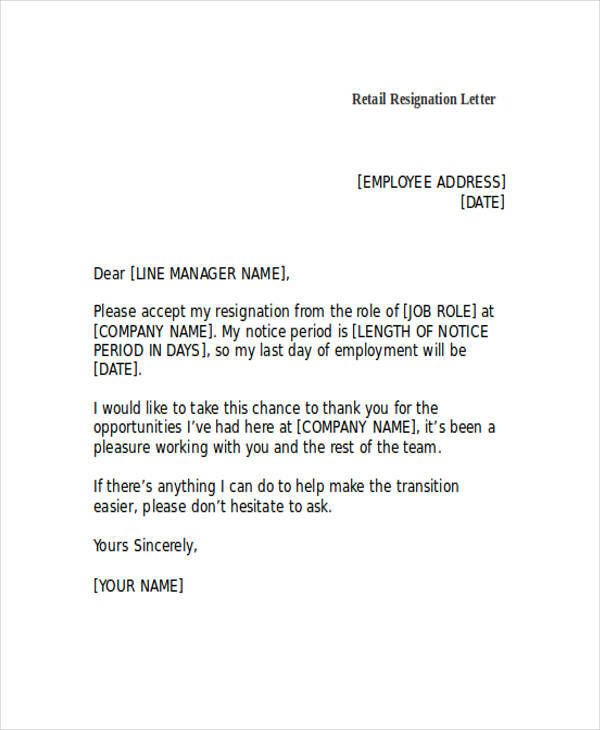 Ideally, this type of a resignation letter is handed personally to the immediate supervisor. 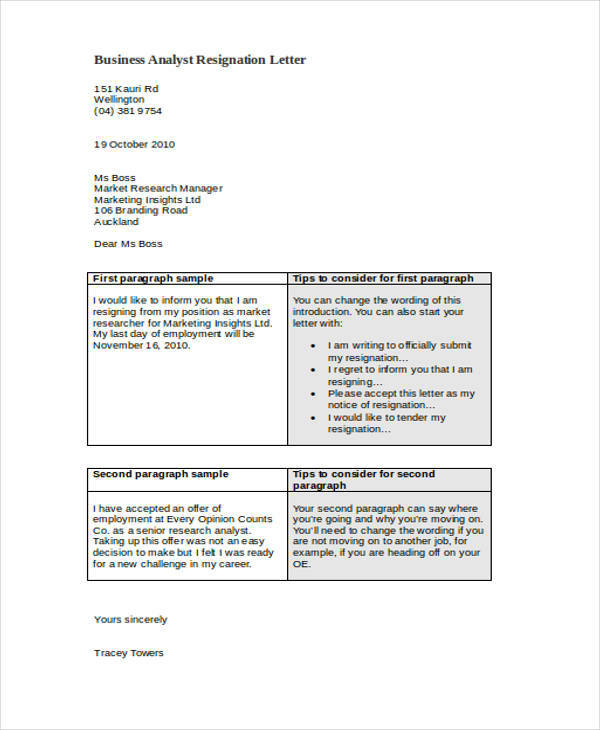 It is brief, concise, and usually just contains 3–4 sentences. 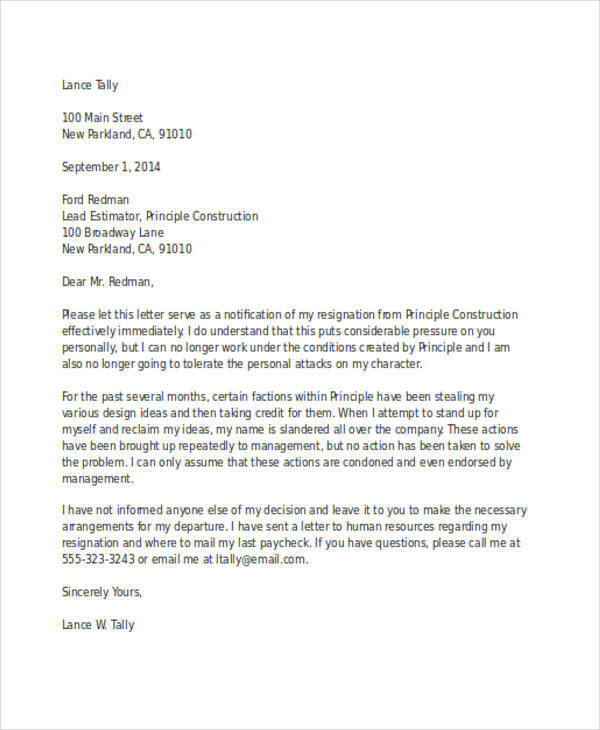 Because of advanced technology, some resignation letters nowadays are sent via email or to the social network account of the supervisor. 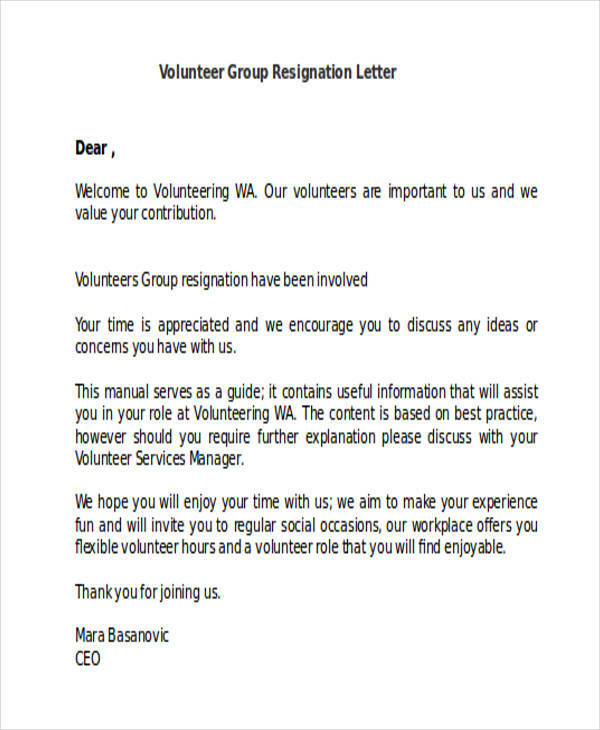 Volunteer Resignation Letter. 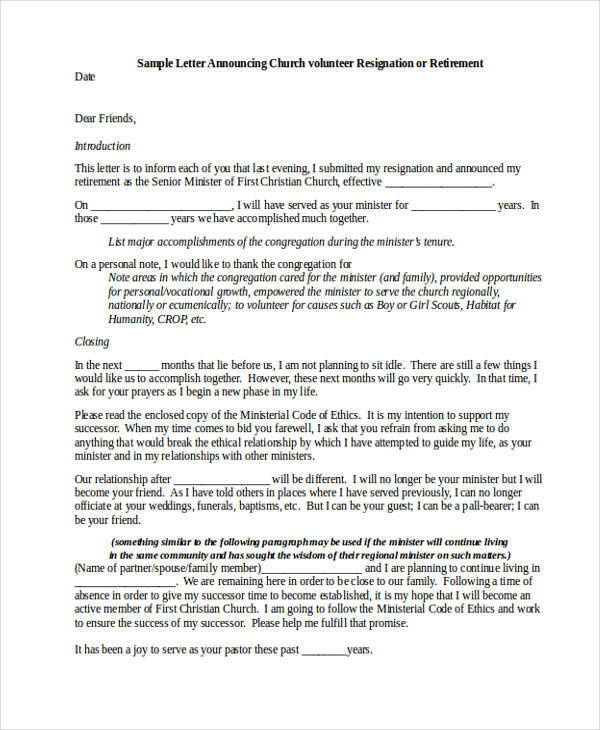 This type is specifically for those who work in the churches or other non-profit organizations. Common reasons are studies, pursuance of a better career, and other personal reasons. 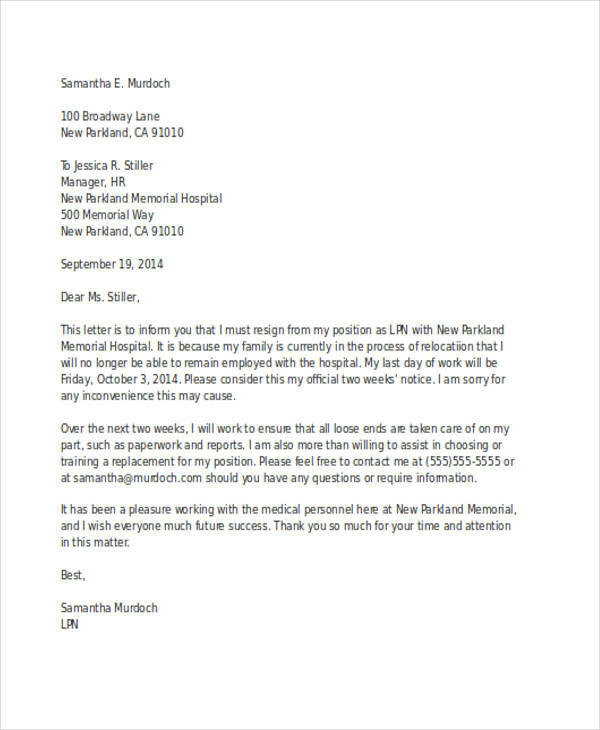 Internship Resignation Letter. 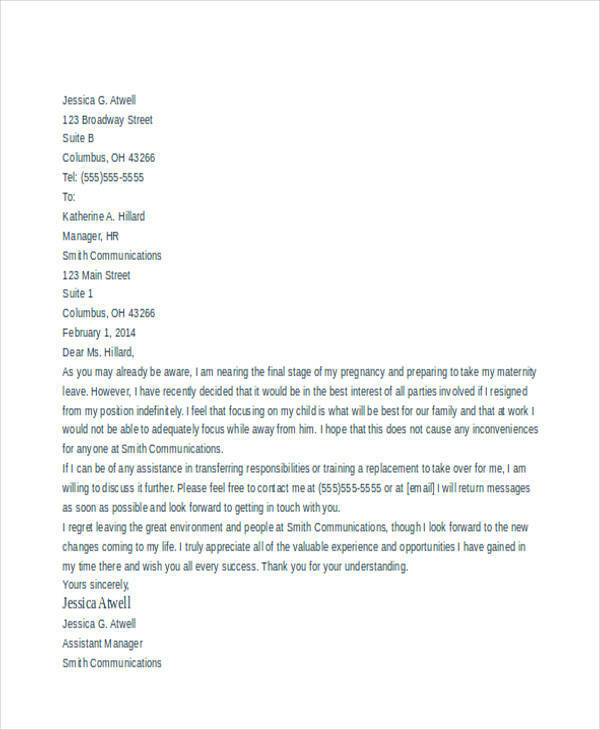 These are drafted by those who work as interns in a company. 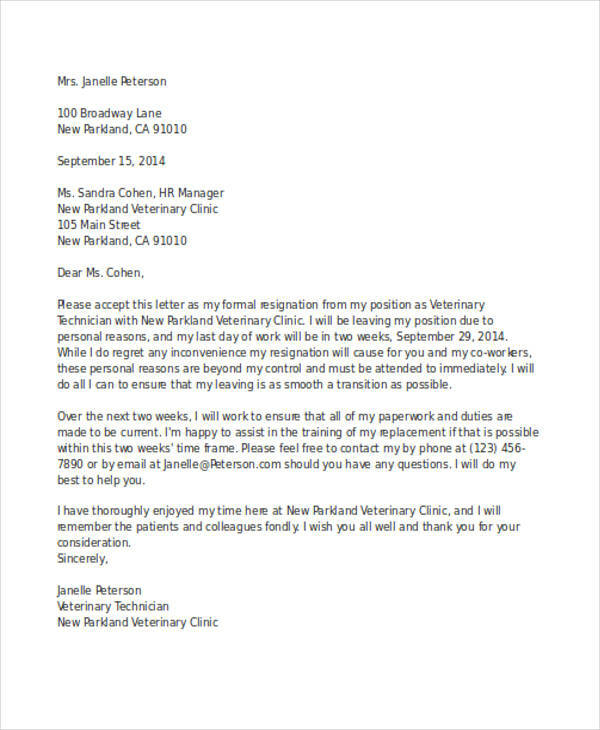 Most part of the letter is an expression of gratitude for the experience. Whatever the reason of the exodus of a person, the most important is the takeaway experience.